How fun is the Sweetest Thing candy shop inspired suit or products?! Its bright and cheery and perfect for offering a sweet treat to those you love! 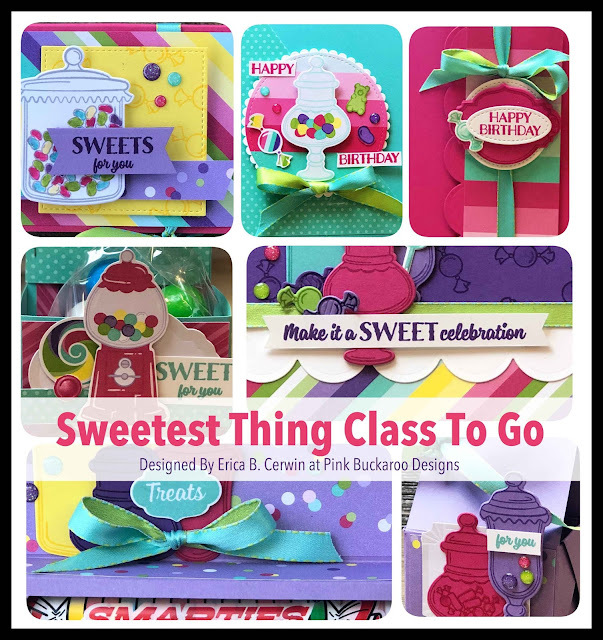 This planner will show you how to make seven projects: three greeting cards, a tiny treat box, a jelly bean wallet, a giant sweet tart box and a Gum Ball Gift Card Box. The class kits will include five project kits and the two other projects will be bonus tutorials in the PDF. You will need Melon Mambo, Gorgeous Grape, Highland Heather, Coastal Cabana, Pineapple Punch and Granny Apple Green ink pads. You will need a Blender Pen for coloring (using the inks) and a 1/8” circle punch. Adhesives required include SNAIL, Tear and Tape, Stampin’ Dimensionals (regular and mini) and Mini Glue Dots You will have the option to add on a Blender Pen when you register if you do not have one already. You can order ink and adhesive here or use what you already have. one 6" square of each DSP pattern. Sale a Bration product of your choice (only those that fit in the envelope) You can see all of them here. you are actually getting the ribbon for FREE! Email me for registration link. Option #1 and #2 both ship priority for $8. If you are local (San Antonio) and would like to pick up your class kit, choose "Porch Pick Up" to save on shipping. Sweet Stampede Members (my downline) can purchase this option for the make and take kits and PDF. Look for the registration link in our weekly email. Registration will close on February 13th . Expected shipping date of all kits is February 20th. San Antonio Stampin' Soiree- Demonstrator Event!